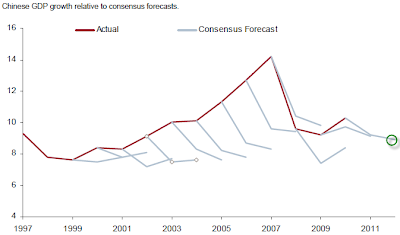 The chart from Credit Suisse shows just how consistently economists have been underestimating China's GDP growth in their forecasts. 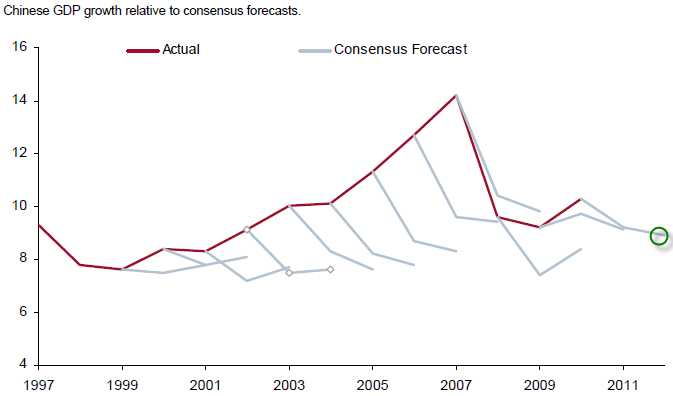 A significant slowdown has been in the forecast almost every year. This is not surprising given that China's double digit growth is simply not sustainable. However each year economists tend to miss the impact of central planning that isn't present in other economies. Assuming it has inflation under control, the government can quickly turn on tremendous amounts of stimulus not available to other nations. Clearly as Zhang points out (above) this type of growth is unhealthy and even dangerous. But in order for the Communist Party to stay in power, it has to deliver strong growth and will stop at nothing to accomplish that goal.